We are honored to have a prayer warrior and encourager of women sharing her heart with us today. Michele O’Leary shares our heart for women to be gathered in community. You can learn more about Michele at her home, Casual Conversations. Today, we pray you are blessed by her words as much as we are. My heart was bleeding pain, sorrow, loneliness. I was shattered, and I finally allowed the pain to seep in. My heart was a sponge, soaking in the reality of my deep missing of me. Even worse in the midst of my meltdown, I realized I had no me. I needed more. I wanted more. But what was the more? I came to realize through prayer that more isn’t a “what” but a Whom. We will never find true purpose in life through activities, a job, family, or even church. Friends, true purpose comes only from our Father. 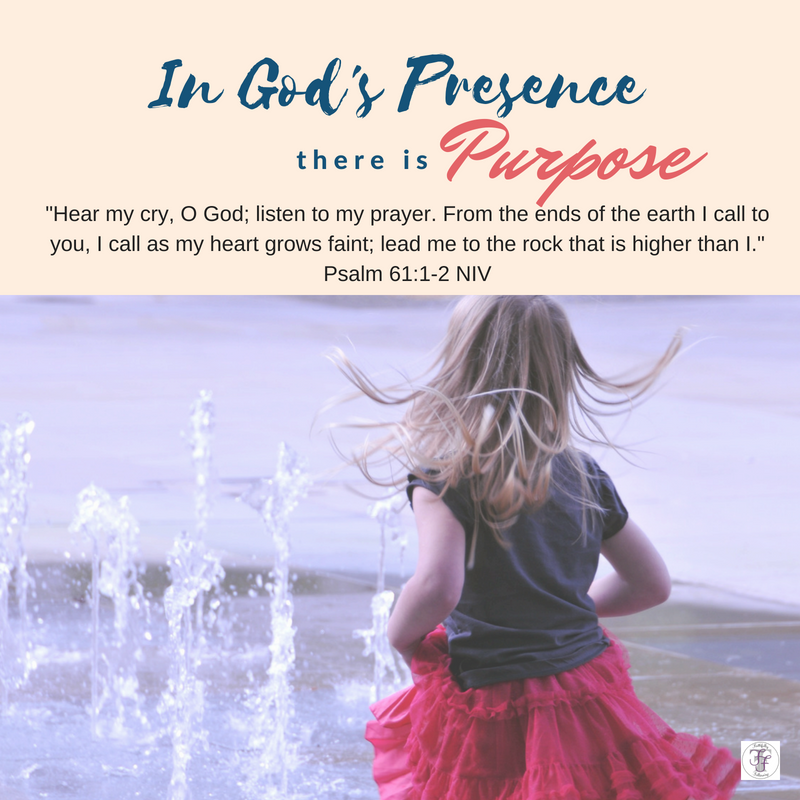 In the presence of God there is purpose. Our purpose is a relationship in Him and with Him. As I started my small movements towards God, he showed me three steps to blossom His purpose in my life. The first step in purpose for me was prayer and still is today. A life-cord to the Cross of Christ. Prayer sets me free to see His purpose in me. How do you prepare for Heaven’s purpose? The Love-Purpose from the Above-Love? Crack open, dig in deep and glean from His Word. The Book from the Truth-Maker. The Holy Bible. He longs and looks and loves when we pause and praise Him in all our ways. He reminds us of the act of pause and praise; our purpose will always lie in Him. Each step is a must in my life to stay in fellowship and in a relationship with my heavenly father. 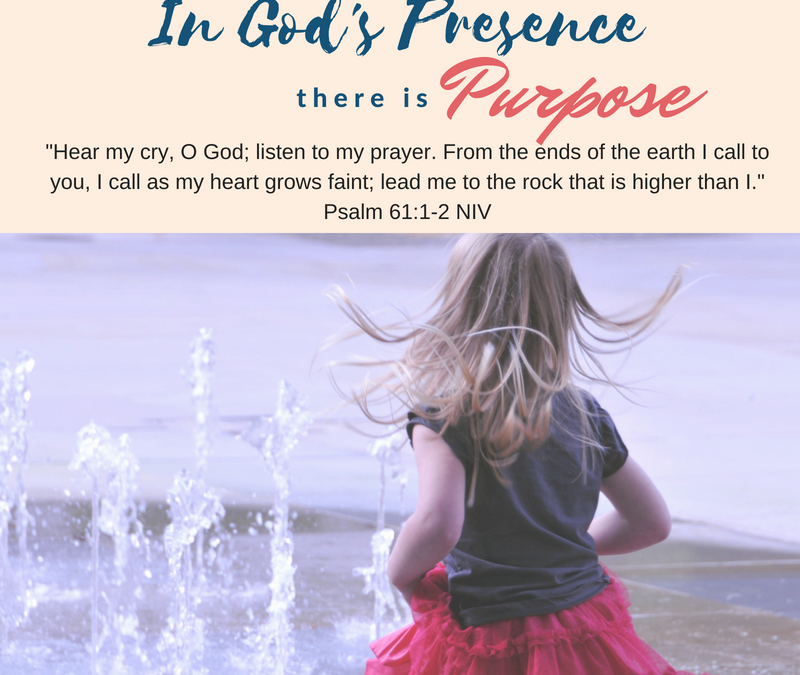 For, in the presence of God there is purpose. There is real freedom in Him. Today’s Prayer: Lord, Thank you for hearing our prayers. Every last one you give ear to and your word says you will respond. Thank you for creating us out of love, for love. Help us to seek you and find purpose in your presence. Have you been like Michele, in search of your purpose? Longing for more? Write out a prayer to the Lord expressing your longing to be in His presence. Read Psalm 61. In verse one, the psalmist pleads with the Lord asking what? In verse 2 the psalmist calls the Lord the Rock that is __________ than I. He then says in verse 3 that God is his rescue and strong tower. Do you ever feel God is out of reach? Is it difficult to comprehend the vastness of God and His ability to be near and far? Read Romans 8:38-39. What can separate us from the love of God? I would like to join your study. How do I go sign up? We like to keep things simple 🙂 You can visit our blog each day or follow our facebook page. If you would like the blog via email you can subscribe to our blog on our home page. We are so glad you are here Anita.